This article describes the new and changed functionality of Hyper-V on Windows Server 2016 and Microsoft Hyper-V Server 2016. To use new features on virtual machines created with Windows Server 2012 R2 and moved or imported to a server that runs Hyper-V on Windows Server 2016, you'll need to manually upgrade the virtual machine configuration version. When the Hyper-V role is installed on a computer that uses the Always On/Always Connected (AOAC) power model, the Connected Standby power state is now available. This feature lets you give a virtual machine direct and exclusive access to some PCIe hardware devices. Using a device in this way bypasses the Hyper-V virtualization stack, which results in faster access. You can now protect the operating system disk using BitLocker drive encryption in generation 1 virtual machines. A new feature, key storage, creates a small, dedicated drive to store the system drive’s BitLocker key. This is done instead of using a virtual Trusted Platform Module (TPM), which is available only in generation 2 virtual machines. To decrypt the disk and start the virtual machine, the Hyper-V host must either be part of an authorized guarded fabric or have the private key from one of the virtual machine's guardians. Key storage requires a version 8 virtual machine. You can also adjust the amount of memory assigned to a virtual machine while it's running, even if you haven't enabled Dynamic Memory. This works for both generation 1 and generation 2 virtual machines, running Windows Server 2016 or Windows 10. Alternate credentials support - You can now use a different set of credentials in Hyper-V Manager when you connect to another Windows Server 2016 or Windows 10 remote host. You can also save these credentials to make it easier to log on again. Manage earlier versions - With Hyper-V Manager in Windows Server 2016 and Windows 10, you can manage computers running Hyper-V on Windows Server 2012, Windows 8, Windows Server 2012 R2 and Windows 8.1. Updated management protocol - Hyper-V Manager now communicates with remote Hyper-V hosts using the WS-MAN protocol, which permits CredSSP, Kerberos or NTLM authentication. When you use CredSSP to connect to a remote Hyper-V host, you can do a live migration without enabling constrained delegation in Active Directory. The WS-MAN-based infrastructure also makes it easier to enable a host for remote management. WS-MAN connects over port 80, which is open by default. Updates to integration services for Windows guests are distributed through Windows Update. For service providers and private cloud hosters, this puts the control of applying updates into the hands of the tenants who own the virtual machines. Tenants can now update their Windows virtual machines with all updates, including the integration services, using a single method. The vmguest.iso image file is no longer needed, so it isn't included with Hyper-V on Windows Server 2016. Starting with version 8, generation 2 virtual machines can use significantly more memory and virtual processors. Hosts also can be configured with significantly more memory and virtual processors than were previously supported. These changes support new scenarios such as running e-commerce large in-memory databases for online transaction processing (OLTP) and data warehousing (DW). The Windows Server blog recently published the performance results of a virtual machine with 5.5 terabytes of memory and 128 virtual processors running 4 TB in-memory database. Performance was greater than 95% of the performance of a physical server. Remote direct memory access (RDMA) and switch embedded teaming (SET). You can set up RDMA on network adapters bound to a Hyper-V virtual switch, regardless of whether SET is also used. SET provides a virtual switch with some of same capabilities as NIC teaming. Virtual machine multi queues (VMMQ). Improves on VMQ throughput by allocating multiple hardware queues per virtual machine. The default queue becomes a set of queues for a virtual machine, and traffic is spread between the queues. Production checkpoints are "point-in-time" images of a virtual machine. These give you a way to apply a checkpoint that complies with support policies when a virtual machine runs a production workload. Production checkpoints are based on backup technology inside the guest instead of a saved state. For Windows virtual machines, the Volume Snapshot Service (VSS) is used. For Linux virtual machines, the file system buffers are flushed to create a checkpoint that's consistent with the file system. If you'd rather use checkpoints based on saved states, choose standard checkpoints instead. New virtual machines use production checkpoints as the default. You can now add a node running Windows Server 2016 to a Hyper-V Cluster with nodes running Windows Server 2012 R2. This allows you to upgrade the cluster without downtime. The cluster runs at a Windows Server 2012 R2 feature level until you upgrade all nodes in the cluster and update the cluster functional level with the Windows PowerShell cmdlet, Update-ClusterFunctionalLevel. After you update the cluster functional level, you can't return it to Windows Server 2012 R2. You can move virtual machines between all of the nodes in the Hyper-V cluster. 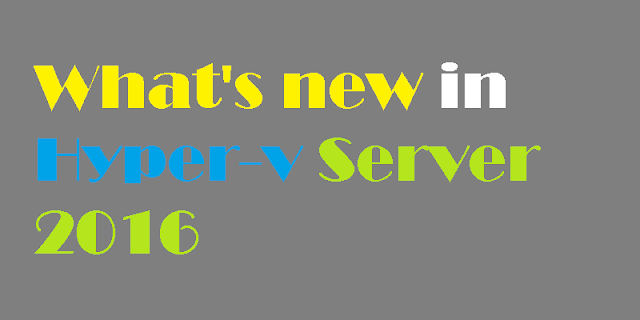 To use new Hyper-V features, all nodes must run Windows Server 2016 and the cluster functional level must be updated. The virtual machine configuration version for existing virtual machines isn't upgraded. You can upgrade the configuration version only after you upgrade the cluster functional level. Virtual machines that you create are compatible with Windows Server 2012 R2, virtual machine configuration level 5. You can enable new Hyper-V features. To make new virtual machine features available, use the Update-VmConfigurationVersion cmdlet to manually update the virtual machine configuration level. You can't add a node to the Hyper-V Cluster that runs Windows Server 2012 R2. Hyper-V on Windows 10 doesn't support failover clustering. Shielded virtual machines use several features to make it harder for Hyper-V administrators and malware on the host to inspect, tamper with, or steal data from the state of a shielded virtual machine. Data and state is encrypted, Hyper-V administrators can't see the video output and disks, and the virtual machines can be restricted to run only on known, healthy hosts, as determined by a Host Guardian Server. As of Technical Preview 5, shielded virtual machines are compatible with Hyper-V Replica. To replicate a shielded virtual machine, the host you want to replicate to must be authorized to run that shielded virtual machine. This feature gives you more control over which clustered virtual machines are started or restarted first. This makes it easier to start virtual machines that provide services before virtual machines that use those services. Define sets, place virtual machines in sets, and specify dependencies. Use Windows PowerShell cmdlets to manage the sets, such as New-ClusterGroupSet, Get-ClusterGroupSet, and Add-ClusterGroupSetDependency. . Virtual machine configuration files use a new format that makes reading and writing configuration data more efficient. The format also makes data corruption less likely if a storage failure occurs. Virtual machine configuration data files use a .vmcx file name extension and runtime state data files use a .vmrs file name extension. The .vmcx file name extension indicates a binary file. Editing .vmcx or .vmrs files isn't supported. The version represents the compatibility of the virtual machine's configuration, saved state, and snapshot files with the version of Hyper-V. Virtual machines with version 5 are compatible with Windows Server 2012 R2 and can run on both Windows Server 2012 R2 and Windows Server 2016 . Virtual machines with versions introduced in Windows Server 2016 won't run in Hyper-V on Windows Server 2012 R2. If you move or import a virtual machine to a server that runs Hyper-V on Windows Server 2016 from Windows Server 2012 R2, the virtual machine's configuration isn't automatically updated. This means you can move the virtual machine back to a server that runs Windows Server 2012 R2. But, this also means you can't use the new virtual machine features until you manually update the version of the virtual machine configuration. After you update the version, you can't move the virtual machine to a server that runs Windows Server 2012 R2. You can't downgrade the configuration to a previous version. The Update-VMVersion cmdlet is blocked on a Hyper-V Cluster when the cluster functional level is Windows Server 2012 R2. Virtualization-based security powers features such as Device Guard and Credential Guard, offering increased protection of the operating system against exploits from malware. Virtualization based-security is available in generation 2 guest virtual machines starting with version 8. Windows Containers allow many isolated applications to run on one computer system. They're fast to build and are highly scalable and portable. Two types of container runtime are available, each with a different degree of application isolation. Windows Server Containers use namespace and process isolation. Hyper-V Containers use a light-weight virtual machine for each container. This gives you a way to run Windows PowerShell commands in a virtual machine from the host. Windows PowerShell Direct runs between the host and the virtual machine. This means it doesn't require networking or firewall requirements, and it works regardless of your remote management configuration. Those tools work well, but have trade-offs: VMConnect is reliable, but can be hard to automate. Remote PowerShell is powerful, but can be hard to set up and maintain. These trade-offs may become more important as your Hyper-V deployment grows. Windows PowerShell Direct addresses this by providing a powerful scripting and automation experience that's as simple as using VMConnect.